The “Awesome Dog Adventures” Face Book group is a free meet up group for dogs and their companions who have completed training with Michigan Dog Training LLC. They hike together at local parks and downtown areas, swim at a local beach and attend off leash play at the Michigan Dog Training facility in Plymouth, Michigan. It’s purpose is to provide on-going dog socialization and fun for both dogs and their companions. 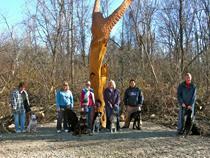 Membership is permission based and restricted to students of Michigan Dog Training LLC. Events are held in southeastern Michigan, primarily in Western Wayne County, Southern Oakland County and Eastern Washtenaw County. It’s a perfect opportunity to stay active with your dog and continue your dog’s socialization for a lifetime. Click her to join the Awesome Dog Adventures group. If your dog isn’t yet ready to join the Awesome Adventures group (either due to lack of obedience or social skills), don’t worry, sign up for personal training or a group class. Prepare your dog now for Awesome Adventures at Michigan Dog Training LLC. This entry was posted in New Dog Training Services, Uncategorized and tagged dog, dog hikes, dog socialization, dog training, Michigan, Michigan Dog Training, Oakland County, Oakland County Michigan, Pet, socialization, Washtenaw County, Wayne County. Bookmark the permalink.